Reading and share top 1 Miriam Darnell famous quotes and sayings. 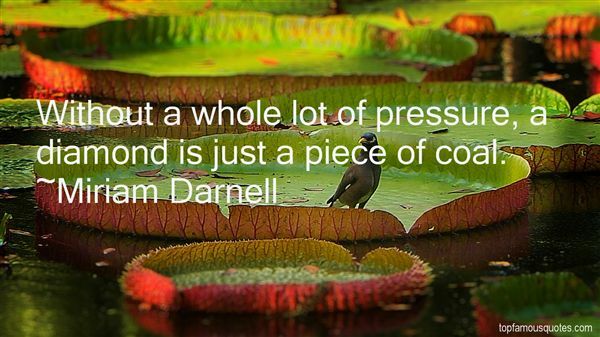 Browse top 1 most favorite famous quotes and sayings by Miriam Darnell. The priests will sell indulgence letters for fornication, for the breaking of vows, for shunning confession, for ignoring fasts, and, of course, for rescuing souls from purgatory. Purgatory," he repeated with a sneer. "This dread place exists, the Church teaches, for the cleansing of sinful man's soul after death, but the Church will gladly give you remission of years of your soul's agony there—for a price. Now, tell me this. If the Pope has the power to deliver a soul out of purgatory, why then can he not deliver it without money? And if he can deliver one soul, then why does he not deliver a thousand? Why not all? Let loose all the poor, tortured souls, and thus destroy purgatory." His fist punched the air. "I say the Pope is a tyrant if he keeps souls within purgatory's prison until men give him money!"